There’s no doubt the App Store has revolutionized how developers can hit the jackpot over night. With over 200 million iOS devices sold, and each user worth a reported $150 annually to Apple, there’s money to be made especially when 15 billion app downloads have been surpassed. As the app’s leading web evangelist, Bettany has earned roughly $400,000 so far thanks to the 20% revenue share she negotiated with the app’s developers. The former linguistics grad student who once struggled to pay the bills as a freelance journalist and photographer is now literally making money while she sleeps. Camera+ has exceeded 3 million downloads, as is one of the most popular apps downloaded. Their former attempt to bypass Apple’s SDK guidelines to implement the volume button as a shutter resulted in their removal from the App Store. Surprisingly, this hack is now a feature in Apple’s upcoming iOS 5. Congrats to Lisa and the entire Camera+ team for their success. You can check out the entire article here. 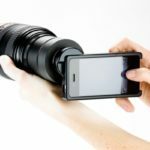 Want To Attach A SLR Lens To Your iPhone? No Problem!